Learn to Create Sitemap without robot.txt file or Without any Sitemap Generator Tool . A sitemap file is a XML file which contains all the URLs of your website. Web crawlers used these files to index your website's URLs in search engine's database. All the major search engine crawlers used this method for faster indexing. This XML sitemap helps your website in faster indexing by Google, Yahoo, Bing and many other search engines. submission of sitemaps are first and important step in seo. Web crawlers finds it hard to index all URLs without a sitemap so it becomes necessary to add one for your blog and website. We will learn how to add sitemaps in google and Bing webmasters tools. There is no need for bloggers to use sitemap generator tools because blogger now have its own sitemap file. Few years back, blogger don't give any sitemap file to its users that's why every one use RSS OR ATOM feeds to publish a sitemap. 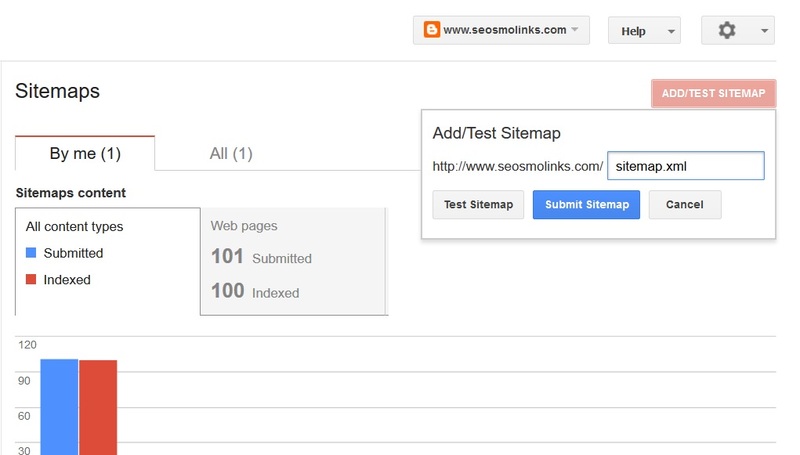 But now Google gives bloggers their very own sitemap file which works very faster and effectively than feeds. Blogger have a problem of indexing only 26 Webpages but now this problem is sorted out by Google blogger with new sitemap file. Below is a example of feed based sitemap file address. Now you will not require to use atom.xml. You will use sitemap.xml in this article. We will add blogger sitemap in latest way. You only need to follow some simple steps. Step 1: visit Google Webmasters tool and login to your account. Step 2: select your blog for adding sitemap file. Step 3: click on sitemap section. Step 4: on the top of this page you will find a button saying add/ test sitemap. Just click on it. Step 5: now a small textbox will open. Put below text in that box. Step 6: press test button and if you found no errors then follow above steps and click on submit button in this step. We know this is the easiest way of setting a sitemap file in Blogger's blog. If you still have questions then please ask us here. I think you already knows that yahoo officially using Bing's database for search results. So if you add your website in Bing's database then it will automatically comes to yahoo search directory. Follow some steps below to add sitemap in bing webmasters tools. Step 1: open bing webmasters tools and create an account if you don't have one. Step 2: login to your account and click on add a site page. Step 3: add URL of your website and your sitemap URL in respective textboxes and then click on submit button. Now you will require to verify your blog by adding meta data into your blog's template. Bing will give you some code for verification purposes and you have to paste these codes into your blog's template. Visit your template editor and just above < / head> add the code provided by Bing. How to Create HTML Sitemap Page in Blogger . By default the HTML sitemap page is created by blogger and you can find it by opening yourblog.com/sitemap.xml or yourblog.blogspot.com/sitemap.xml . If you find any problem in this tutorial please feel free to ask any question below. Replace Infiblogger.com With Your Domain Name. Paji maine pheli bar blog banaya hai.. Wo salla google search engine mai show nhi karta.. Kitna. Time lagta hai google mai anne ki liye Ya mere se koi galti hui hai banane waqt..
Hor maine free ka domain use kiya hai..